New Industrial Tribal Spike Necklaces. 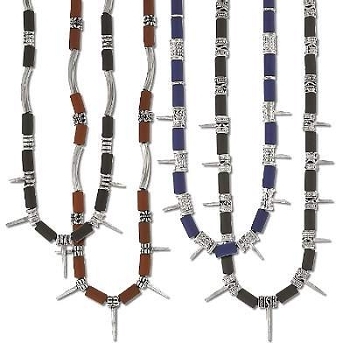 The necklaces are just over 18 inches and are intermixed with silvertone spacers, color tubes and metal spikes. Each necklace has a slightly different design. The necklace are available in blue, purple, brown, red and black. The necklaces will be shipped in assorted colors. You can request specific colors and we do are best to meet your requirement. All measurements are approximate.